Military leaders speak to a Senate panel Thursday about how they're defending our nation with less funding. Good morning! Digital First Media's national politics team will be live blogging here news from a congressional hearing on how budget cuts are affecting national defense. The chiefs of the American military's four branches will speak to the Senate Armed Services Committee about how sequestration is impacting their defense strategy. 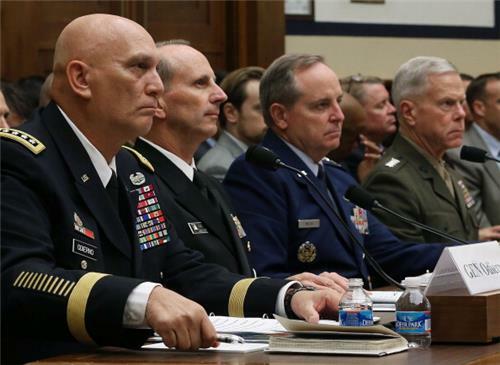 Speaking at the hearing is: Gen. Raymond Odierno, Chief of Staff of the Army; Adm. Jonathan Greenert, Chief of Naval Operations; Gen. James Amos, Commandant of the Marine Corps; and Gen. Mark Welsh, Chief of Staff of the Air Force (pictured below in a September House hearing). 9:37 a.m. we begin, with Chairman Sen. Carl Levin (D-MI) introducing sequestration as a threat to our national security: "Our military leaders have been warning us of its consequences," he said, citing global security, concerns among our allies about our readiness and an underfunded and furloughed defense sector. Sequestration was designed to be unpopular with both Democrats and Republicans. That seemed to hold true at the beginning of the hearing as Democratic Sen. Carl Levin and Republican Sen. Jim Inhofe agreed in their opening statements that the mandatory defense cuts were harming the military. Levin called it "arbitrary and irrational," while Inhofe said the U.S. is "at a point where our allies don't trust us and our enemies don't fear us." In his opening statement, Army Chief of Staff Raymond Odierno warned that sequestration would hurt the Army's readiness and modernization over the next decade. He cited the years just before World War I, when American military planners thought they did not need a large army, as evidence of the shortsightedness of this approach, warning that there are a number of threats to the U.S. around the world right now. "I do not consider myself an alarmist," he said. " I consider myself a realist." Sen. Mark Udall, a Democrat from Colorado, said he’s frustrated that the military’s leaders have to spend time testifying about indiscriminate budget cuts Congress manifested. “We in the Congress created this monster,” he said. Udall noted Gen. Mark Welsh’s comment that sequestration is actually going to cost the Air Force more money in the long run and asked Welsh how he would create a dream budget that saves money. Udall said he’s working with Sen. Susan Collins, a Republican from Maine, on developing a budget that allows for agencies to implement with flexibility. Sen. Saxby Chambliss, a Republican from Georgia, said in the midst of sequestration he thinks Congress is mandating the branches of military to spend money on toys it doesn’t need. (This often happens when a member of Congress pushes for a lucrative production deal with the military that benefits his or her district). Chambliss listed example after example, including a new fleet of tanks that Army Gen. Raymond Odierno has said he doesn’t want. Sen. Jeanne Shaheen, a Democrat from New Hampshire, touches on the impacts of sequestration on the Portsmouth Naval Shipyard in her state. She asked Adm. Jonathan Greenert of the Navy about the long term impacts of sequestration, who replied that the nuclear shipyard is “premiere” and “one of the most stable” but that frustrated civilian and military employees there tend to leave their jobs because of furloughs. Sen. Kelly Ayotte, a Republican from New Hampshire, brings up Afghanistan and asks for the latest. A very optimistic Gen. Raymond Odierno of the Army said he thinks “we’re making incredible progress” there and that as long as America keeps the right amount of troops in the country to help train and advise Afghan security forces, the country will eventually stand on its own. Though he gave no timetable for when that might be. “We have come too far, we have invested too much to back away from that now because we are close on the cusp, I think, of being successful,” he said. The conversation sticks to Afghanistan as senators question the chiefs on a timetable for how long we will stay in the country. Sen. Tim Kaine, a Democrat from Virginia, said he urges supporters of the military to pressure members of a congressional budget committee to create a long-term budget in the next month that replaces sequestration. He also took a swipe at Sen. Mike Lee, a Republican from Utah, for Lee’s attack that President Barack Obama is focusing more on Obamacare and gun rights than the effects of sequester on the military. “I found those questions quite odd,” Kaine said, noting the president submitted a budget to Congress that Congress then didn’t pass.